Elder Sign: Omens is an application that delivers the tense excitement of Richard Launius and Kevin Wilson’s popular dice game to an all-new digital medium. Its detailed instructional resources and intuitive interface will have you investigating in minutes, while its deep and engaging gameplay provides countless hours of eldritch horror. Can you stand against the impending arrival of Azathoth? Elder Sign: Omens places you in control of up to four intrepid investigators, as they fight to keep the all-powerful Azathoth from invading our world through a museum's arcane exhibits! 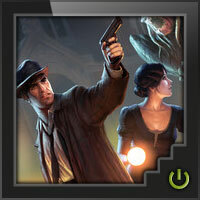 Learn how to play Elder Sign: Omens, FFG's latest app for iPhone, iPad, OS X, and Android! Digital version of board game Elder Sign. The game you love for its easy going and fun coop gameplay with dice. Wrong! This time Ancient Ones are back with vengeance to shed pain in your life. Since this version was released after the board game, there are bound to be differences. Some things have been streamlined and improved upon, most notable being that its a lot more difficult. Every room/card requires proper thought before entering, because that decision might be the one that kicks your plans out of the window. -No allies (which arguably is most ignored part in board game too). -Locked die in spell don’t carry over, but are lost at the end of round. -No penalty upon failure to assisting investigators. -Some of Ancient Ones have a campaign to go with them, which is nice. -More challenging (I said this before, but it is so good it deserves another mention). Game starts by player picking Ancient One to battle with then setting his/hers 4 person investigator dream team together to seal the slumbering god away. From there-on the game is pretty simply divided on lobby where you can look at general situation with Elder signs and Doom track, your general equipment and locations where you can go. The other part comes when you choose a room to go, there comes the dice rolling phase where you try to meet the requirements of the tasks. Which ends often on either you going “YES!” and clenching your fist in triumph or the more common one: hanging your head down in defeat whilst you draw an inch closer to your own insanity. Playing this is pretty much same as in the board game Elder Sign, except almost every time you enter to new room its cold calculation and acceptance on the risk that this can ruin all you have built up until now. As a personal nemesis of mine, which I believe is directly responsible of my increasingly receding hairline, is double tapping a room in lobby or accidentally pressing on wrong place whilst checking tasks on room in lobby. That however is marked on my own clumsiness. As a first point on this I have give props to UI design. Especially on a cellphone the layout shines. Layout is made in such manner that the important things are visible and clear what is for what. Most of the player inventory cards have small symbols on them to make it easier to tell what they do, which speeds up game nicely. Tasks, penalties and rewards on the room cards are clear and makes it easy to decide where to go. Cards terror and at midnight effects are clearly present on lobby, same goes with monsters and otherworld gates. Art is beautiful and its evident that FFG has invested proper time to make the game look good. Its not just a cheap rip of the board game. A nice cherry on the top of this all is nice intro movie to get you in proper mood, which unfortunately is same every time with exception on the special campaigns on few of the Ancient Ones. Solid portable single player version of excellent board game and as hard as it should have been originally. Great way to fill longer or shorter moments, when there is nothing to do than wait. Of course you can play it because its just so fun. Comes with save function for one game (it prompts when you try to start new game in case you want to finish the old one). Doesn’t need altering of rules to make it more difficult for it is difficult from get-go. Its fun and can be stopped and continued anytime you want. One word of warning. The phone version comes cheap, but if you want to have a go at more difficult Ancient Ones you need to purchase them separately and along it you get some investigators, so basically they are additional DLCs. PC version comes with everything from first purchase. It is not always easy to translate a physical game into digital format, especially in the compact size of a mobile device. 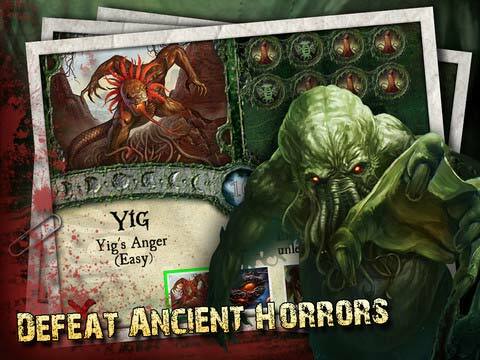 Fantasy Flight Games struck gold with their app version of the Elder Sign board game, successfully capturing both the tense horror atmosphere of the original and transposing the exciting dice-rolling into a seamless touch-based experience. Hovering around $4 and available for iOS and Android, this is a great app to add to your phone to itch a board gaming scratch on the go. The game itself is set in Lovecraftian mythos – an alternative version of the 1920’s with heavy infusion of the supernatural and the interdimensional. Great Old Ones – ancient beings of unimaginable power are lurking beyond the thin veil of reality and are struggling to break through. An old museum, filled with relevant artifacts, threatens to become a portal into our world. Should the ancient evil awaken and step into our world – destruction would surely follow so a ragtag team of investigators come to the museum to solve the mysteries it holds and prevent the Great Old One from manifesting. The game consists of a series of adventures – at each point of time you have six to pick from. A player has six green “glyphs” – dice-like components that generate one of six random results, symbolizing the results of investigations – peril, lore, terror etc. You “conjure the glyphs” (read “roll the dice”) and then use the results to match these up to the “tasks” – required combinations to complete the adventure. If you are able to complete all the tasks of the adventure – you succeed and are rewarded, otherwise you fail and suffer the consequences. While that may seem like an entirely luck-based exercise, the game actually has a fair bit of strategy and probability management. Certain abilities allow you to manipulate the results of your “rolls” changing one results to another or retrying an unlucky roll. Certain items allow you to either get additional glyphs/dice or save past rolls for future use. There is a fair bit of diversity in the game – base offering comes with four Great Old Ones, each with their own challenges and difficulty level. You can challenge and you can select your team of four from a group of seventeen investigators. The adventures you will face are randomly drawn and varied. There is a lot of game here for just $4. The game features excellent mood-setting art and the interface is intuitive and easy to learn. If you are familiar with the board game – know that the app uses the rules almost exactly the same way with only a couple of notable exceptions. One – it completely removes the board game’s mechanics of battling the Ancient One – once they awaken. It is a welcome change as the idea of fighting Cthulhu with a tommy gun never quite seemed right to me. Second change is that glyphs “saved” using spells can only be used in current adventure, not reserved for future ones. This change unfortunately reduces spells’ efficiency and does a small disservice to the game as a whole. One of the Elder Signs: Omens greatest strength is how easy it is to turn it on, play a couple of adventure and then leave it until later. This episodic nature really lends itself well to the hectic way you might be playing on a mobile device. At the same time if you have more time to kill – you can definitely play a more dedicated game. A full game will take about 20 minutes. At this point the game is strictly single-player with no multiplayer options. Once you grow tired of the base game – the three excellent expansions available for $2-3 each do a magnificent job of broadening the game’s horizons. While these do add your regular “more items, investigators and adventures” – each presents a unique campaign that takes your team to different locations for unique (and very tough) challenges. These are highly recommended. 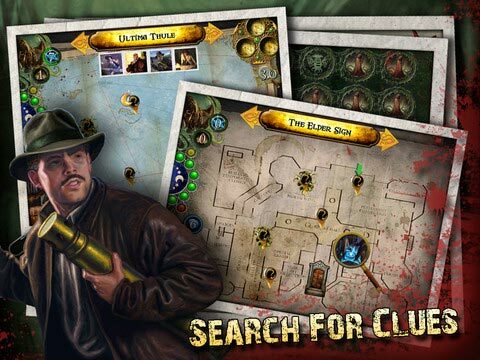 Whether you like Lovecraft, the Elder Sign board game or just looking for a cool new app on your phone – Elder Sign: Omens comes highly recommended, sure to help you kill some time in a tense and engaging way. If you enjoyed this review please visit Altema Games website for more board game materials. UPDATE – After another miserable, failed go at Cthulhu, I have decided to a) delete the game from my iPad; b) downgrade it from my initial ‘7’ to ‘4’; and c) never speak of this again. If you want more info on why I quite this game and gave it a bad score, read my Impression under the Discussions tab. I bought this for my iPad after I became addicted to Elder Sign. While Omens is a great way to scratch that ES itch, it has some shortcomings that will keep it from replacing the board game. THE GOOD – It’s mobile. It’s Elder Sign in the go! It comes with some terrific video tutorials. Can be helpful for figuring out those sometimes-hard-to-interpret Fantasy Flight instruction manuals. THE BAD – It would be nice to see an animation of cards (mythos, common, unique, etc.) being ‘drawn’. Without that, it doesn’t look like a board game. That is in no way a deal breaker, but it IS something I had to get used to. The digital version also did away with the Ancient One battles that sometimes occur when the doom track fills up. It was quite jarring when I expected Yog-Sothoth(sp?) to awaken and do battle with my investigators. Nope. I was treated to some animation of the world coming to an end and a “You failed” message. Ummmm, okay. THE UGLY – There’s something ‘off’ about having the sensation of rolling physical dice removed from me. Yes, it’s digital and therefore mandates the need for artificial dice rolling, but that feeling is gone…and with that feeling come another, less appealing sensation of the game somehow ‘loading the dice’ with rolls AND location cards. Example, after taking it to Cthulhu in the museum (7 elder signs to his 0 doom tokens), everything got turned upside down in the second half of the game. Suddenly there were THREE “at midnight” effects in play, two of which were adding one or more doom tokens per round. That coincided with my investigators’ dice rolls suddenly going cold. Mysteriously, conveniently cold. The very same thing has happened to me when playing the board game version but again, I go back to the dice rolling aspect. When I roll dem bones and they come up useless, it’s all on me. When the game does it for me, I have my doubts. SUMMARY – Elder Sign Omens is a GREAT game for when you’re on the go. It plays smoothly and channels the board game quite well. It DOES have what I feel are some dubious dice rolls and location appearances, plus the latter half of most Elder Sign encounters (battling the Ancient Ones) is simply not there. Is it worth the cost? I say yes. Does is replace the board game? No. I played and ultimately traded Elder Sign in its physical form. The game was fine, but I really only bought it because of the theme. When it comes down to it, Fantasy Flight has milked Cthulhu and his kin far beyond anything natural. The board game version has the same tired art and the same tired feel of several other Fantasy Flight games, but I still bought this app to try it (go figure). This game is crazy hard. Any by hard I mean brutal, and by brutal I mean challenging (in a good way). You will lose again and again. If you don’t lose several times before beating an ancient one, you either got lucky (the game does have dice) or you are yourself an ancient one. That being said, it’s not frustrating really because the strategy of building the perfect team to beat the different ancient ones is solid (and addictive). Picking a team based on the style you like and then beating the game with them is very rewarding. In Conclusion, you should buy this app. It’s polished with great animation (you’ll want to turn off the character title animations after a play or two – it’s under options). The sound quality and art is top notch. The gameplay is challenging and addictive and you have lots of options for team building and playing. Oh, and grab the Cthulhu expansion, it’s worth it. Just a heads up, I plan on giving this the full review treatment. If you just want to see what is different between this and the board game, skip to the end. Welcome to Arkham Yatzee, electronic edition! Alright, calling it Yatzee is a bit unfair, but you are essentially rolling dice hoping for a series of desired results, so, boiled down, that is a somewhat apt description. Disclaimer: I own this on Android. I am guessing that the game is the same on your Apple device, but I cannot attest to that. The base game cost me $3.99. There is an expansion available for an additional $2.99. I have not purchased the expansion. In addition, I have seen some describe Elder Sign as “Arkham Horror Lite” I have played one game of Arkham Horror in the past, and that was some time ago so I cannot make the comparison for you. So, onto the game. Elder Sign is set in the Lovecraft universe. I am not going to go into a lot of Lovecraft lore, but suffice to say that many creatures of great and terrible power and visage have existed before time itself and want to eat and/or enslave us and just touching the surface of their realms can drive a person mad. One of these Great Old Ones is trying to enter our world with the help of degenerate cultists and the portal is the museum in which our game takes place. Figure on a game taking half an hour to an hour. Once you get the game up and going, you need to choose a Great Old One to try and stop from entering our universe. You can choose from Yig, which is tantamount to easy mode or Azathoth, which is considered medium mode. If you have purchased the expansion, you can also choose Cthulu, which is considered hard mode. You then choose 4 investigators from a pool of 16. The expansion appears to include and additional 6. Each investigator has varying sanity and stamina statistics, certain starting items and a special ability. Once you choose your team, an intro movie plays and then the game begins. The game plays in landscape mode. If you have not played before, there is a decent tutorial system that offers to play every time you do something you have not before. If you were so inclined, you can reset the tutorials if you wanted to hand your device over to someone who has not played before so they can see them. You see a blueprint of the museum and there are various points of interest marked, called adventures. Your investigators start at the entrance of the museum, and return there every time their turn comes around again. You can click on an adventure or the entrance to focus on it, then on the banner on the top of the screen to see what the adventure requires to complete or what you can do at the entrance. The ultimate goal is to score enough Elder Signs by completing adventures to seal away the Great Old One. That is 10 for Yig and 14 for Azathoth. If you take too long, or fail adventures, however, the doom track begins to fill with doom tokens. Too many of those, and the Great Old One awakes. So, let’s go on an adventure! You activate the adventure, and a graphic tied to that adventure comes up, then the requirements appear along with the HUD. The adventure will have one to three tasks to complete. They have no names, just a picture with smaller inset pictures depicting the glyphs needed to do that task. You click on the book to roll virtual dice and summon glyphs. You normally get 6, but by using items can add a special red and/or yellow die. You then try and match the glyphs you rolled to the adventure requirement. If you cannot use your rolled glyphs to complete one of the adventure’s tasks, you can discard one of the glyphs you summoned and re-summon the remainder. Rinse and repeat until you successfully complete all adventure tasks or fail, either by giving up or running out of glyphs. The yellow die removes the terror side and adds a 4 Investigation, and the red die also removes the 1 Investigation and adds a Wild. Tasks can include things like 2 Peril, 1 Terror and 1 Lore, etc. There can also be sanity and stamina costs just to complete the task. The museum is a rough place, and investigations in the Lovecraft universe generally do not leave you whole even when you win. Some tasks on an adventure can be completed in any order, and some must be done in a certain order. You cannot complete more that one task per roll, so even if you have glyphs you wanted for further tasks, you have to re-roll and hope. If you do have to discard, you can pull an additional glyph from the remainder to the side to save for the remainder of the adventure attempt Other items you may have could also allow you to save a result or re-roll dice of your choosing. A successful adventure scores the reward for the adventure, which can include items and spells to help out on adventures, access to alternate dimension adventures where the rewards are greater, trophies to spend at the entrance on healing and items, and the coveted Elder Signs. Fail, and suffer the consequences. These can include damage to your sanity or stamina, doom tokens or monsters being added to adventures, making them harder to complete. There is some more to this, but that is adventuring in a nutshell. Each investigator takes their turn, and each adventure turn moves the clock. Essentially, every 4 investigator turns will turn the clock to midnight. At midnight, uncompleted adventures with a midnight effect (depicted with a moon) cause their listed effect, which may add monsters, harm investigators or increase the doom track. A doom token is also added automatically, and may cause a monster to appear as well. If a investigator looses all of their sanity or stamina, they die. If all of your investigators die, it is game over. I know for a fact that if Azathoth awakens, it is game over. I think you might be able to battle Yig, but, frankly, if I fail to seal Yig away it is because all of my investigators die, not because I filled the doom track, so, frankly, I do not know. I do have a couple of issues with the mechanics of the game. Sometimes it doesn’t like where my finger is when attempting to drag and drop glyphs, but that got better over time as I figured out where the device wanted my finger to start. I get a bit irritated that the game, or at least the movies, do not ignore the auto sleep function of my phone. I have yet to see the entire opening movie because my phone goes to sleep, and when I wake it up by touching it the movie gets pre-empted. On the other hand, the game auto-saves when you close it, so if you wanted to pick up where you left off it is easy to do so. For those of you who want to know the differences between the digital and board game versions, here you go. The allies have been removed entirely. There doesn’t seem to be any lingering mythos that I can see. Spells can be cast AFTER the glyphs are rolled, so in response to something that you wanted to keep. If an investigator dies, they are dead. No picking a new one. There are significantly less Great Old Ones to choose from. There seem to be easier monsters in the pot against Yig than against Azathoth, and the midnight effects are harsher against the latter. There is also no set-up and no clean-up, which is nice. You can just start it up and play, and stop when you would like. So, is it worth the purchase? I think so. I played it a great deal the first week I had it, and after that I start it up now and then. I also strongly recommend it if you are interested in the board game but just aren’t sure it is for you. Four bucks isn’t too much for what can amount to a preview of the $35.00 game, and they seriously are close enough that you would get the general idea. Elder sign is based on a dice matching mechanic very similar to Yahtzee. One by one you will send your investigators on adventures around the museum where they will unravel the mysteries of the Cthulhu mythos by solving a number of dice matching tasks. The dice matching mechanic transfers rather well to a touch screen device; tap an icon to roll and drag dice to assign them to the various tasks or to discard. To help you in your adventures are various clues, items and spells which all have various effects such as replenishing health or sanity, re-rolling dice or adding more dice to your pool. If the investigator succeeds they are rewarded with these items and even the coveted Elder Signs needed to win the game. If they lose they will be wounded, loose a piece of their mind or worst of all, aid the coming of the Great Old One by adding to the doom counter. After all four investigators have had their turn the clock strikes midnight and doom counter slowly advances. I say slowly, at first you feel as if you have plenty of time. The doom counter seems to advance at a snail’s pace but once one of your investigators is six feet under and another is visiting a comfy padded cell you realise you don’t have enough time or resources to stop the end of the world. Occasionally, just to ruin your day even further, a monster will appear, these get added to existing locations and defeating the monster becomes an additional task required to complete the adventure. Thankfully defeating monster, and completing adventures, rewards you with trophies which can be spent at the museum foyer to gain equipment or heal your wounded investigators. Trophies can also be used to by elder signs but this is an expensive way to do it. Elder Sign Omens provides a good spread of different investigators to take on their maddening quest. Each investigator not only has different levels of health and sanity but also has special abilities they can bring to the table. Having this variety also brings some longevity into the game. 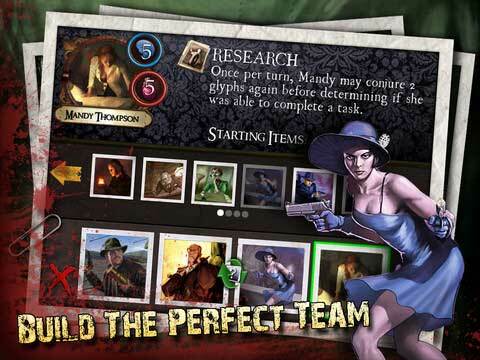 Selecting you investigators and using them to the best of their abilities is the key strategy to success in this game. Omens is not a full conversion of the physical game. Some elements have been stripped out or streamlined; most notable of which is the boss fights. In the real world game if the doom track progresses far enough the investigators have to battle the Great Old One. For the virtual Elder Sign, when the Great Old One awakens the game is over. The full complement of Great Old Ones has been reduced to two, plus an extra in the expansion, and these two represent two separate difficultly levels. Where Elder Sign Omens really triumphs is mood. Lovecraft’s worlds are dark, mysterious and terrifying. The music and sound effects, although simple, succeed in evoking the mood of Lovecraft’s vision and ramps up the feeling of increasing dread. The areas of the museum are expressed via static images and the artwork used is top notch. Admittedly if you have already played any of Fantasy Flight’s Cthulhu based board or card games you’ve probably seen many of the images before but again they evoke both the 1920’s setting and the horror of the game drawing you in to the setting. Elder Sign Omens is a game that is perfectly suited to mobile devices. It is too light a game for a desktop PC or a living room console but on a mobile device the gameplay is simple enough that you can play for a few minutes but engaging enough that you keep coming back to complete your game. There’s no doubting that the Omens is a touchpad game that just works; the dice mechanics have been beautifully transferred to mobile devices and the graphics and user interface are easily understood even on a tiny iPhone screen. The game evokes Lovecraft’s terrifying setting well and the music and sound effects add the impending sense of dread that physical games just can’t do. In the end though, Elder Sign Omens is a game about rolling dice and is subsequently entirely luck dependant. You’re aim is to influence that luck by selecting the correct investigator for each task, and carefully using spells, skill and equipment available but if you’re after a game with more tactical control then this isn’t for you. If you are after a light foray into the Cthulhu Mythos or are waiting for an Arkham Horror videogame then this is definitely for you. I love the original Elder Sign game, so this was a natural choice to buy when my girlfriend recently bought an Ipad. Initially, I was disappointed with this game. I found the controls to not be particularly intuitive and choice to be significantly more restricted than in the original. After a few play throughs though, I warmed to it and it’s now a game I play quite regularly. Works very well as a solo game, much better than the physical version in fact! No components to set up and easily transportable on your Iphone/Ipad. At £5.50 this is a cheap way to get your elder Sign fix. Strategic element to team selection and resource allocation within tasks makes this much more fun than a simple game of chance. Narrow range of difficulties. Yig is ‘normal’ (quite beatable within 5 or so play throughs) but the other 2 Ancient ones are significantly more difficult to beat! There’s no ‘medium’ option! Controls are not as intuitive as they are in the original. Limited replay value in the long run due to low number of Ancient Ones. A bit cheeky to charge £4.00 to unlock 2 extra Ancient Ones! I managed to find a way to freeze the game! if you lock your final 2 glyphs using a spell lock, the dispose glyph icon doesn’t appear and you’ll have to fail the adventure! Not as good as the original in my opinion. However, for the price I would recommend buying this if you enjoy the Cthulhu setting or want a quick and slightly tactical game to kill some time on your Ipad/Iphone/Android. Be warned, it is difficult though, and that can be frustrating! The rules might take a few play throughs to completely ‘get’ as well! Overall, I’ll give it a 6 out of 10 (where 1 is terrible, 5 is fine and 10 is incredible). I gave in recently and dropped $6.99 to get “Elder Sign: Omens HD”, which is the iPad version. The iPhone version is a separate game, which I did not play. That screen is just too small, yo. I’m interested in playing the board game version, so I figured the iPad version would tide me over until then. The visuals and sound are amazing! Not only do you get some interesting cut scenes with nice voice overs, the in game graphics are fantastic – almost like you would expect from a console version of a board game. The gameplay is fast and easy. I have read that setting up the board game version for Elder Sign can be complicated – but not the case with the iPad version. I appreciate not having to reset a board or knowing the rules to keep the game moving. Not always am I able to play board games with a group. This has no setup, no clean up, and I can play the game with one hand and eat pizza with the other – and game pieces and dice don’t have to get greasy. Score. I found that my first couple of games I was lumbering through not really knowing what was going on. I would have preferred a tutored first game, where it showed me as I went along what was happening and why. For me it was far too easy to miss that the tutorial videos are under the help menu. They are accessible inside the game as well, as long as you know where to click. Yes. Definite purchase for fans of the Cthulhu mythos or interesting board games. It’s got the cool 1920s-30s feel to the coffee and blood stained map that shrieks H.P. Lovecraft. Fantasy Flight knocked it out of the park with quick, smooth and challenging gameplay. When it includes a tutorial play mode, I’ll make my wife play it too. You’ll probably love this more than me if you’ve played and liked the original “Elder Sign” board game, but that’s ok. There’s plenty of “Elder Sign: Omens” for both of us to love. If you play board games, owning a good smart phone or a tablet is an excellent device to add to your games collection. Although neither will replace the social aspects of playing a board game nor the pleasure of handling a game’s physical components, a good version of a board game adapted to either device will capture exactly the feel and tactics of its play whilst handling the game’s mechanics. Such a good version should also offer solo play as well as play against other opponents, or if a co-operative game, allow the participants to play together. The version of Rio Grande Games’ Carcassonne adapted by exozet games is excellent example of the former, whilst Elder Sign: Omens is an excellent example of the latter. It is available on the Android and iOS platforms, this review having been done on an Android tablet. As the title suggests, Elder Sign: Omens is the electronic adaptation of Elder Sign, the third co-operative board game of Lovecraftian investigative horror published by Fantasy Flight Games. Where Elder Sign has up to eight investigators exploring Arkham Museum to prevent the strange goings on that herald the coming of an Ancient One such as Azathoth, Cthulhu, or Yog-Sothoth, Elder Sign: Omens has a team of up to four investigators exploring Arkham Museum to prevent the strange goings on that herald the coming of the Ancient One known as Azathoth. The game has the intrepid investigators visiting the various parts of the museum, some of which might lead to other dimensions, and casting glyphs that will counter or stop the strange goings on in each location. The investigators will each have their own special ability that will help them in this casting as various spells, items, and clues that in turn enable then investigators to hold onto glyphs between castings, add more glyphs, and re-cast the gylphs. If successful, the investigators can gain more spells, items, and clues as well as the all-important Elder Signs that they need to accumulate in order to prevent the coming of Azathoth. If unsuccessful, the investigators can suffer deleterious effects to their health and sanity; have monsters appear particular locations that need to be dealt with before the tasks there can be attempted; and let Azathoth gain more of the Doom Tokens that mean that the Outer God is closer to Earth. At each incident, an investigator will be confronted by one or more tasks. Sometimes these have to be done in a certain order, but most can be completed in any order. Either way, only a single task can be completed with a single casting of glyphs. These are cast to match the symbols on each task, the glyphs either being used to match the symbols or re-cast to get the ones needed. Re-casting the glyphs is usually done at the cost of losing a glyph on the next casting. Consistent quickly leads to the investigator failing to deal with the incident and suffering various effects as described above. The players need to accumulate fourteen Elder Signs if they are to prevent the coming of Azathoth, who only needs to gain twelve Doom Signs. This is not an easy task, especially if monsters appear that make tasks more difficult or even prevent glyphs from being cast until they are dealt with. In addition to the growing number of Doom Tokens, a sense of urgency is built into the game with a clock that regularly strikes midnight and heralds further terrible effects such as more monsters appearing or Azathoth acquiring yet more Doom Tokens. The players’ choice of investigators will ease or hinder this task, with investigators who can re-cast glyphs tending to be easier to use, if not being more useful. With sixteen investigators to choose from, Elder Sign: Omens has the capacity for the players to experiment to get the right combination of investigators that they are happy to explore the museum with. Physically, Elder Sign: Omens is very well presented. The artwork, much of it seen in previous games of Lovecraftian investigative horror from Fantasy Flight Games, is used to great effect with some of it animated as certain events occur. In fact, on a tablet device, the artwork is better presented than in the actual Elder Sign board game, where the artwork, although very good, is too small to be really appreciated. Elder Sign: Omens also handles the physical mechanics of the game, such as the clock striking midnight and the appearance of new incidents, with a pleasing deftness that makes the game flow uninterrupted. Together, the removal of these mechanical processes away from the players’ gaze and the removal of the clutter of components that can be an issue in Fantasy Flight Games titles, combined with the use of the map to guide the investigators around the museum serve to give Elder Sign: Omens something akin to a narrative flow, which unfortunately, is somewhat lacking in the board game itself. If anyone has played the Elder Sign board game, they will notice certain differences between it and Elder Sign: Omens. Most obvious is that fact in casting the glyphs to attempt tasks, the players are not actually rolling dice as they are in the board game, but the removal of the dice gives the play of the game much more an immediacy. The other noticeable differences between Elder Sign and Elder Sign: Omens are that only the one Ancient One is ever faced in the current version of Elder Sign: Omens and that it is not possible for the investigators to have Allies in Elder Sign: Omens as they can in Elder Sign. Neither of these should be seen as actual omissions, but rather as a streamlining that eases the flow of the game. The final major difference is that in Elder Sign it only matters whether the investigators prevented Azathoth from coming to Earth or not, whereas in Elder Sign: Omens, not only does that matter, but so does how well they did. At the end of each game, the performance of the investigators, and thus the players, is scored. The game keeps a record of the scores, so everyone can check to see how well they have done. For anyone new to the game, Elder Sign: Omens comes complete with a tutorial that guides you through the game with the aid of a nicely ominous voiceover – this voiceover also narrates various events throughout the game. To chilling effect. The tutorial itself needs careful attention to fully grasp how the game is played, and is probably worth watching again after at least one full play through of the game. Fortunately, the tutorials can be reset to watch again. Overall though, anyone who has played Elder Sign will have an easier time in playing Elder Sign: Omens than someone who has not. As a playing experience, Elder Sign: Omens is an excellent solo experience. It also plays well with two participants, their discussing various courses of action and deciding what each investigator will do and what each will do with their glyphs. With more players, the game slows a little essentially because everyone is sat around a small screen and the decision making process takes a little longer. Nevertheless, having the tablet makes the game feel faster and slicker, as well containing everything needed in one easy to hold package. I have Elder Signs : Omens for the iPad, and it can be a lot of fun. I’m more fond of the regular, table top dice version of the game, but ESO is nice to have when you are on the go and looking to play a good Cthulhu Mythos game. I have found that despite several updates, the game still is prone to occasional bugs, most of which have been pretty minor. The earlier version was prone to crashing at times, and while the stability is better now my most recent version has the minor problem of resetting the scores every time I exit the game. The add on content for Cthulhu, Pharoah and Ithaqua are a lot of fun, adding completely new dimensions of play. In fact, the three new Ancient One stories can make the original four games set in the museum seem almost plain by comparison. They are also considerably more difficult, and the Ithaqua game can even take difficulty to a frustrating level – there are random events at various points in the game, and I once had three consecutive games in which I lost all my supplies as I entered the “home stretch”. Having said that, when you do beat him, it’s that much more rewarding. It’s a great solo play game when you just want to kill some time. It is a real challenge to win until you find the perfect team, and work out a solid strategy. The production quality is great and very well polished and the art work with the sound effects keeps the theme alive throughout the entire game. The downside to the theme is that there is only one boss that you go up against. Once I figured out those two factors the game actually got to be a little to easy. You go up against the same Elder every time so your strategy does not have to vary because the way monsters and such behave the same. Once I found out the best team and worked out a strategy I was winning 3 out of 4 games. Is it worth the money? Yes. This is a great solid game available on the limited Android market of digital board games. Lets hope Fantasy Flight creates an update that will add more Elders for some variety. Given gamers’ enthusiasm for Arkham Horror, Eldritch Horror, and Mansions of Madness, I was interested in trying one of them. Then I found that Elder Sign was billed as “Arkham Light” and could be played in less than an hour. I shopped for the board game, but bought the digital version for $4.99. I had high hopes for Elder Sign: Omens, and it has great graphics and features. My chief complaint with ES: Omens is the digital dice rolling. It is incredibly difficult to “roll” the needed icons to complete tasks. Dice rolling is inherently random, but these dice seem rigged against the player. I quickly grew frustrated with repeated failures caused by my awful die rolls. There was very little decision making to be done. Just move to a site in the museum, and roll a diminishing set of dice. ES: Omens is a lovely digital game, and the theme is great. I simply could not find any fun being killed by poor rolls of the dice. Given all the favorable reviews, I am sure this app has worked well for many players. I would still like to play the physical game, but the app just did not work for me. I got the tabletop version a couple of months ago, and I am enjoying it. Since I read the rules and handled the components, I have a better grasp on how to play. The digital version now makes a bit more sense, but it is tough to win. Great game for first-timers to the world of Lovercraft and gaming. Easy to play but hard to win, though rewarding when you achieve it. All the major Lovercraft old ones are here and the production but into this by FFG really brings the game to life, from the art work to the sound design and voice-overs, gives you the sense of being right in the expeditions, fights, searches and horrors of the museum and other locations that the game takes you to. With expansions available the game also has some staying power and has so good re-play value. It is a lot of fun, I continue to play it, but there are game busters that don’t make it as fun. Jenny pretty much makes any boss easy. I find that sometimes the dice at the bottom of the screen can make other menus come up, which is annoying, but other than that it is nicely interfaced. Still confused on how I can use the spell cards with other characters. once I use it, it usually disappears. The expansions are really the best part I think, The Chthulu one is truly epic when you win or lose. I was looking forward to this game and was going with the randomized team set up the first few times. I wasnt even close to win the game. Then I tried a put together a team my self. I won a few times and lost a few times, and all this on the easiest level. Well enough said about that. My problem with this game is the randomized signs you get when trying to solve quests. You have no security what so ever that you’ll get some of the components to solve your quest. The stuff you have rerolls (which are as much random as the original rolls), transforms (which transforms one component to another – and is likewise random) and you have red and yellow additions (which again is random). If I’d new about this ahead of buying it, I wouldn’t bother spend the few bucks this game costs. On the pluss side the graphics are good. I saw that the board game was popular and thought I’d give the phone App a go before laying out the cash. Well glad I did as this is rubbish! I had trouble understanding the purpose of this game. It all comes down to luck of the signs that come up on each of your tasks. I never got near completing many of the tasks and I simply got bored with it very quick. I hope the board game is better BUT I doubt I’d bother with that now. I’ve deleted the game from my phone now. Looks great plays poor. All luck. Add a Review for "Elder Sign: Omens"